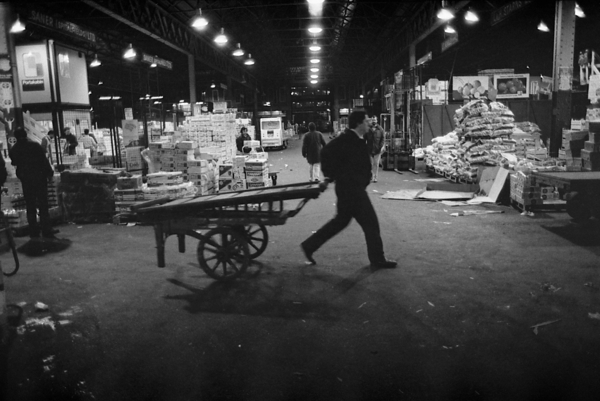 Last year, I published the first glimpse of the extraordinary unseen trove of over three thousand photographs taken by photographers Mark Jackson & Huw Davies during the last year of the Spitalfields Fruit & Vegetable Market before it moved out. 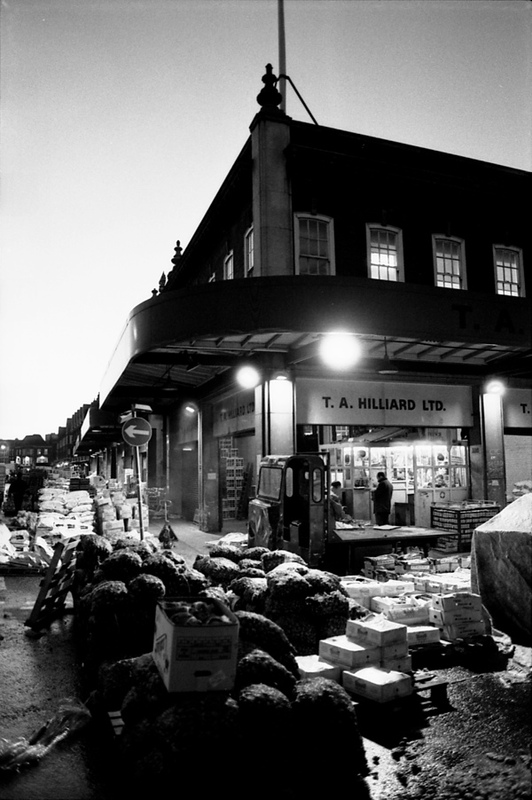 Then I was only able to show you the few prints which existed, but now the Bishopsgate Institute has scanned all the negatives, it is my pleasure to publish more, chosen from the entire corpus of photographs recording the old market which traded in Spitalfields from 1638 until 1991. 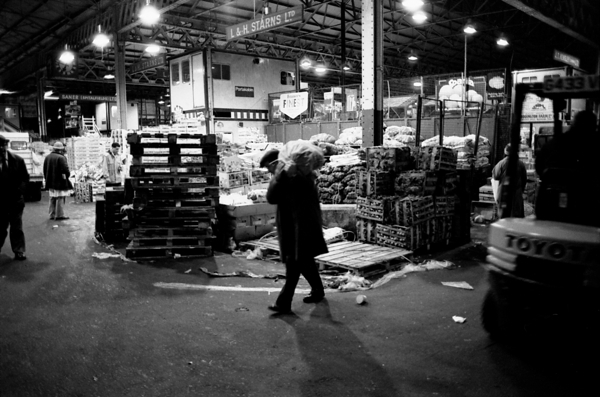 In this selection, I have chosen pictures that convey the nocturnal drama of the market and although they were taken only twenty years ago, they seem now to be images from the eternal night of history – with fleeting figures endlessly running, fetching and carrying, pushing barrows from the flaring lights out into the velvet blackness, where a bonfire burns beneath the great tower of Christ Church, Spitalfields, looming overhead. 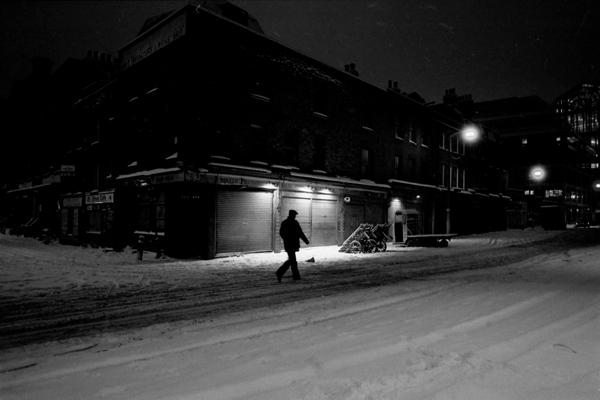 Mark Jackson & Huw Davies were poets with cameras, aware that they were in an epic world with its own codes and customs, and they recognised the imperative to record it before it disappeared. No one asked them and no one paid them – as recent graduates, Mark & Huw shared a tiny flat and worked, as a courier and in a restaurant respectively, to buy film and subsidise their project. 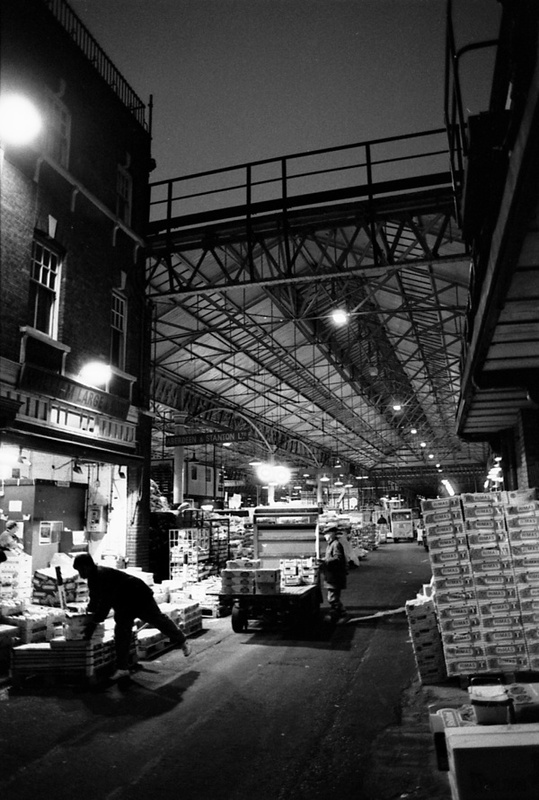 Each evening they took the last tube to Liverpool St Station and spent the night at the market, taking pictures and befriending the traders, before going straight back to work again in the morning, often without any sleep. the church was located there after the market was established? the juxtaposition for all those centuries is touching beyond belief, as is the young mens’ self-imposed task. so beautiful. thank you. Merci à nouveau pour vos contributions quotidiennes dont je me régale au jour le jour. Anne D.
Wonderful images. 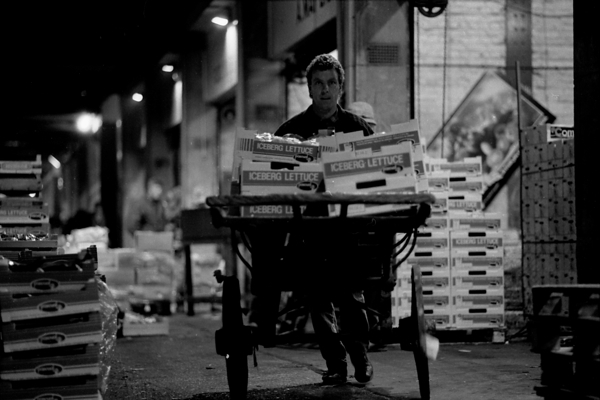 What struck me was the sheer volume of produce being traded. And what happened to those wonderful carts? Just wonderful. Thank you Mark, Huw and Gentle Author. 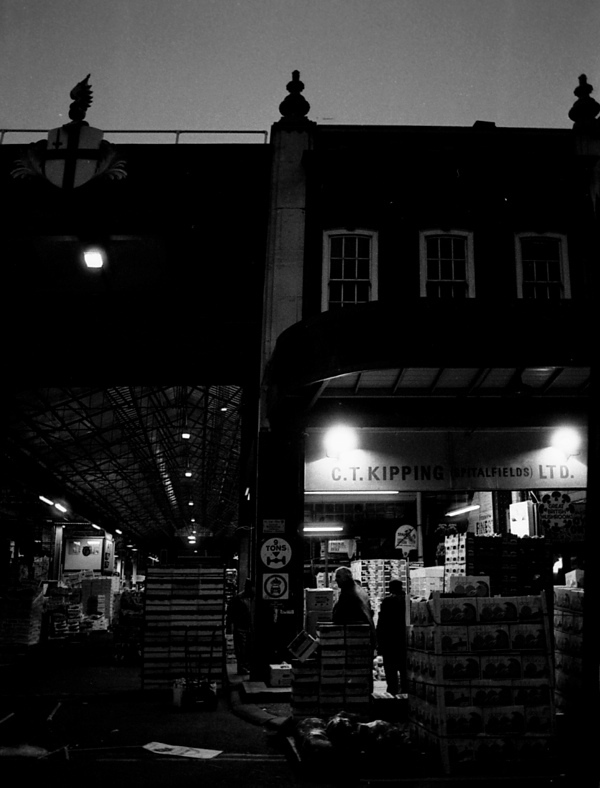 The black and white photographs are so atmospheric and I like the fact that the newer photos taken by Mark Jackson at the new Spitalfields are in colour. The characterful faces old and new are beautiful. 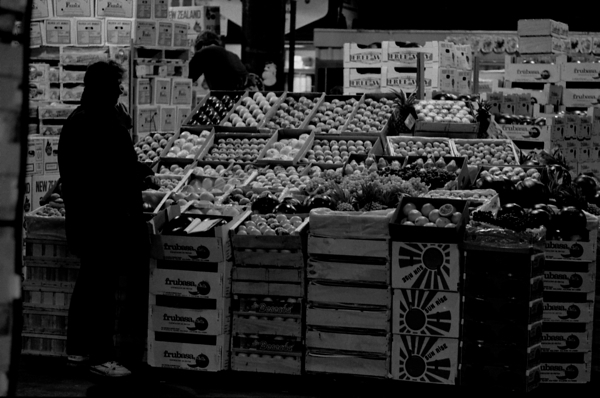 We owe them a lot – unsung and unseen heros (and heroines) getting our “5 a day” to us! Were the photographers present when their fantastic works were unveiled at the Institute. 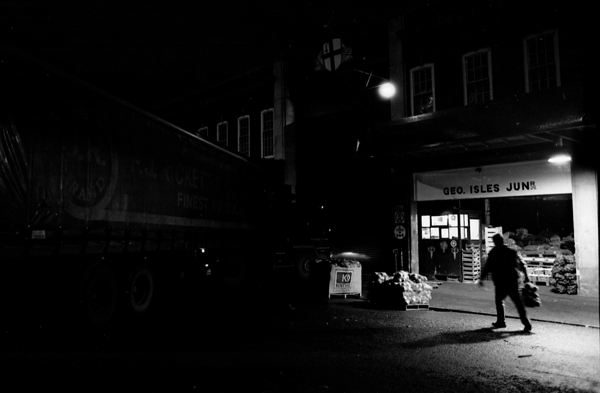 I commented on a previous post that as a boy, I had worked for a wholesale fruitier. 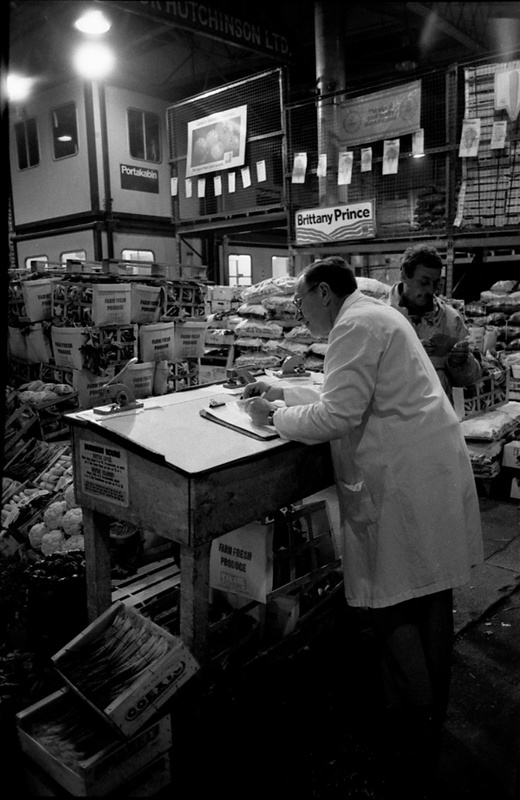 This may sound strange, but, looking at these photographs, I can actually smell the fruit… I’m sure that anyone who has worked at a place like this will know what I mean…. 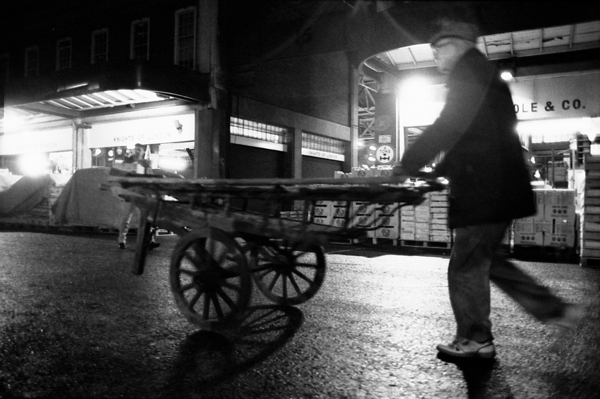 Great photos, very evocative. 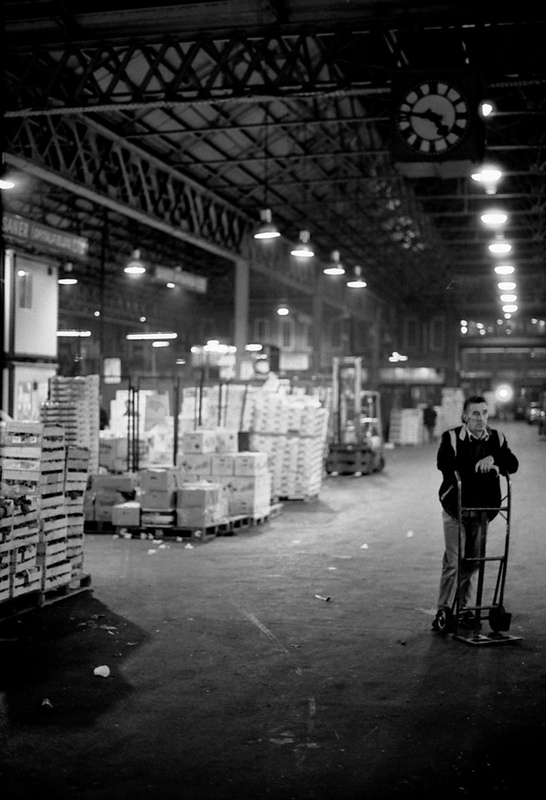 Worked here over two winters 1962/3 , great atmosphere and had many funny experiences there. 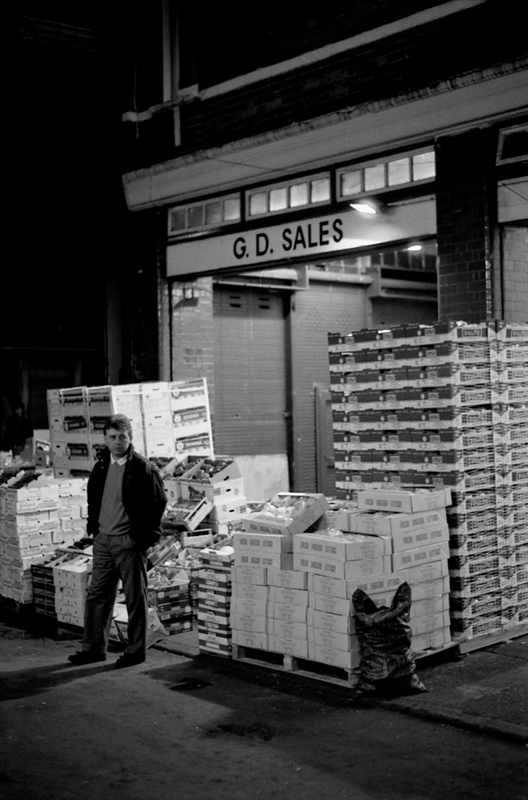 Was a salesman and met many great London characters. 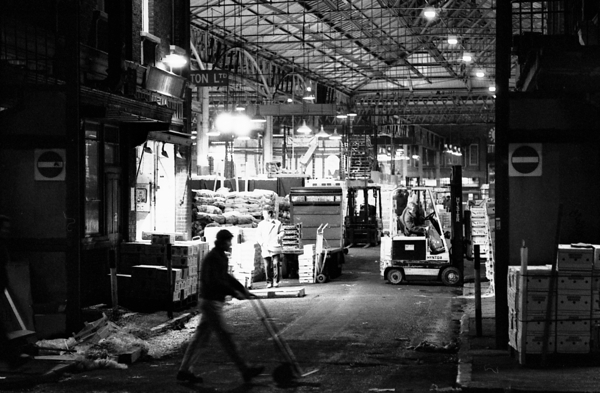 Later worked in the old Covent Garden Market shortly before it moved to Nine Elms. 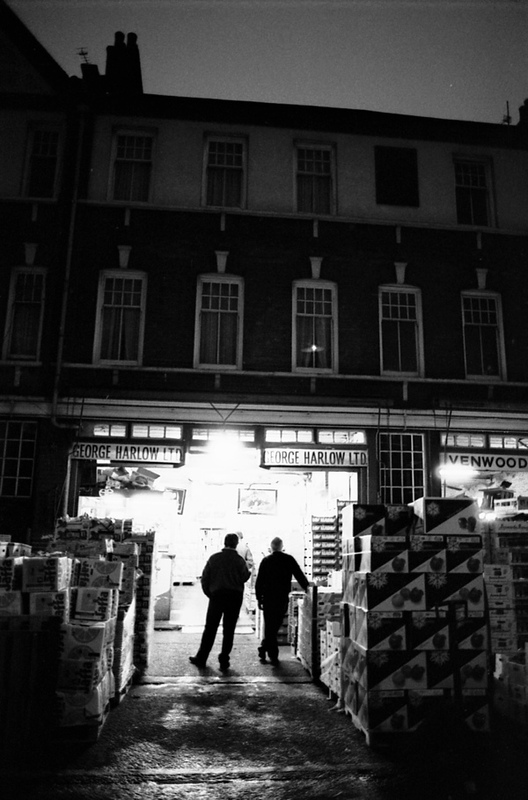 I lived in one of the flats in the Horner Buildings (and a house on Brick Lane) for a short time in the mid-80s. 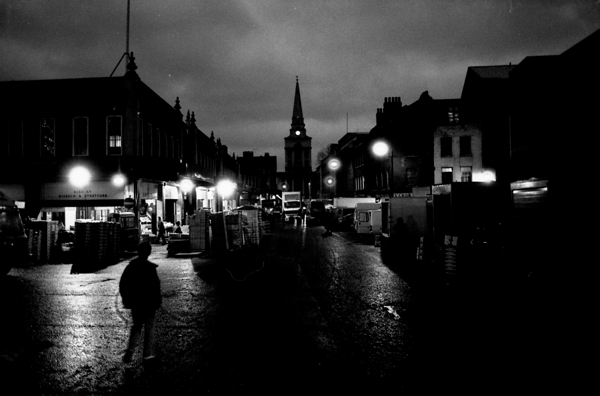 My fascination for Spitalfields has never left me, even after all these years and despite its transformation into a trendy, upmarket area, unimaginable then. 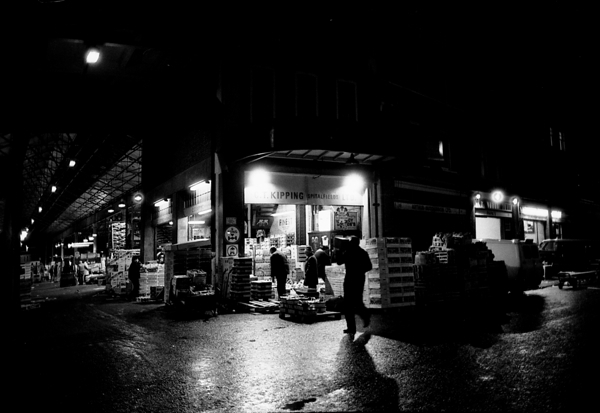 Seeing these photos brings back strange memories of this twilight world, walking back home in the dark in the evening or early morning, that are hard to reconcile with how the area looks now. 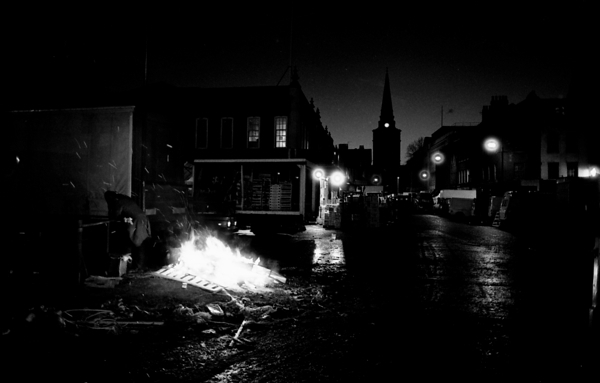 Especially when there was a small bonfire of old crates or pallets on the open ground just after you turned into Brushfield St, just like in one the photos above, with shadowy figures huddled round it – some of whom I would have known from the work I did and who were a desperate, even desolate part of the area’s struggle to survive. 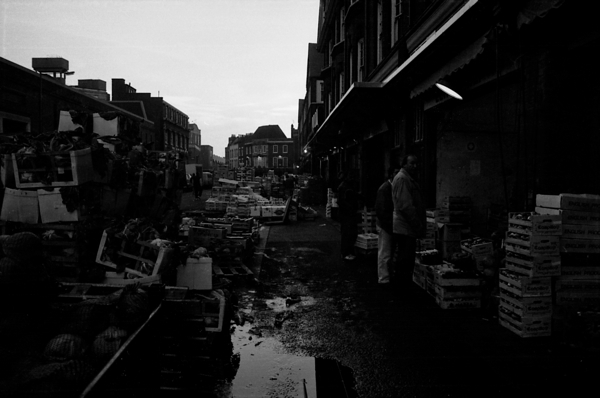 Though the market was on my doorstep, literally – the hustle and bustle and clamour and as soon as you stepped out onto the pavement, fruit and veg boxes stacked everywhere, not to mention lorries parked up overnight under my window, engines running constantly – it also seemed so remote. 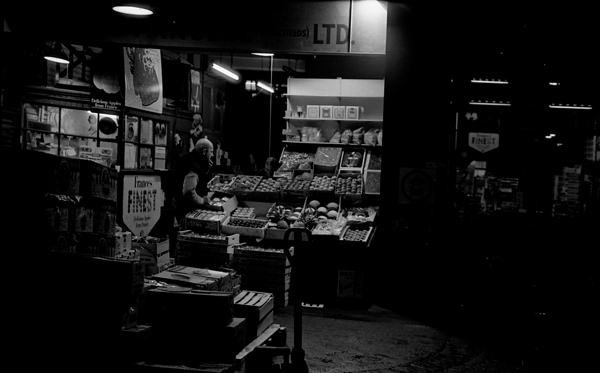 I only remember getting a fleeting glimpse of what went on through the giant archways, or through the grimy windows at the back of the flat (which we kept permanently shut because of the terrible stink from bits of fruit or veg lying forgotten in corners and rotting away). 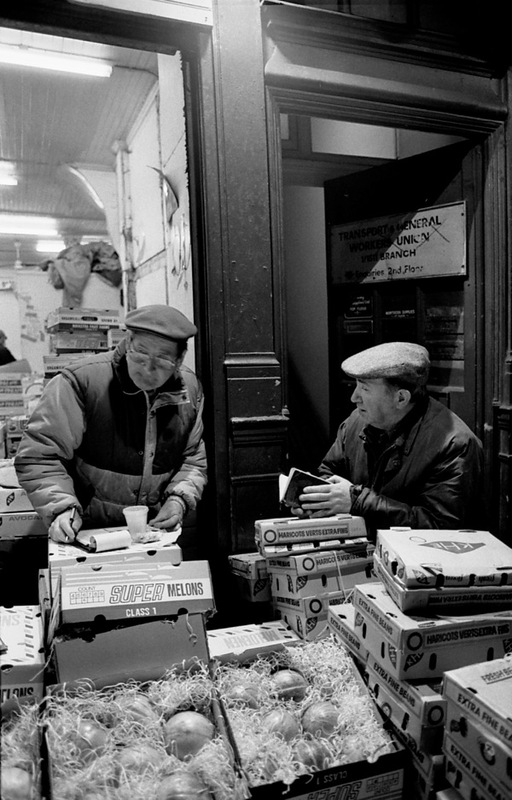 I’ve probably seen more of the life of the market on these pages than I ever did then, and now it’s gone. Such amazing pictures. 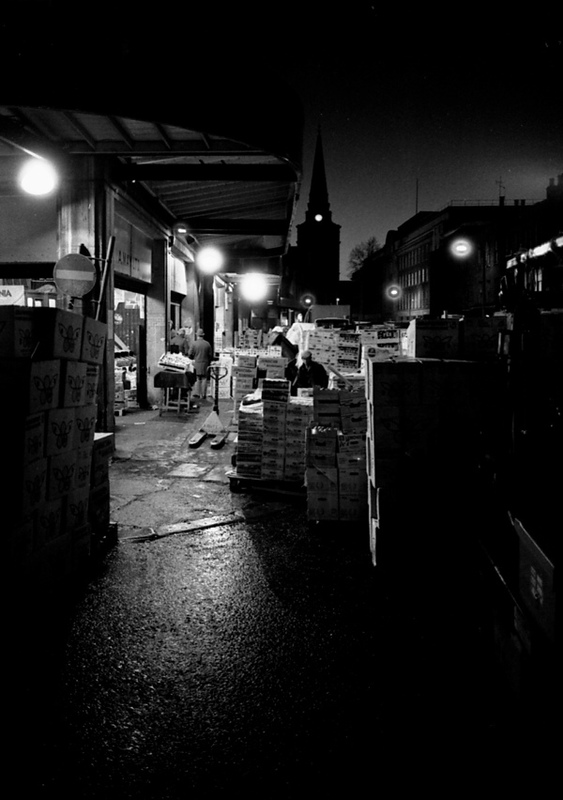 My father was a fruit importer/exporter at Spitalfields during this period and spent almost 50 years of his life there. 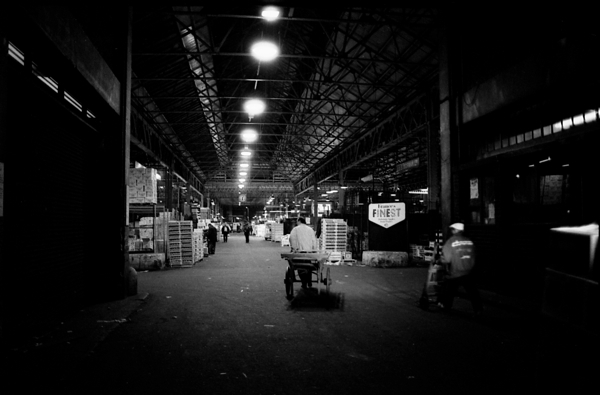 Seeing these picture has bought back a lot of memories for me, I miss the market a lot and still think it’s sad that they moved trade out to Temple Mills. 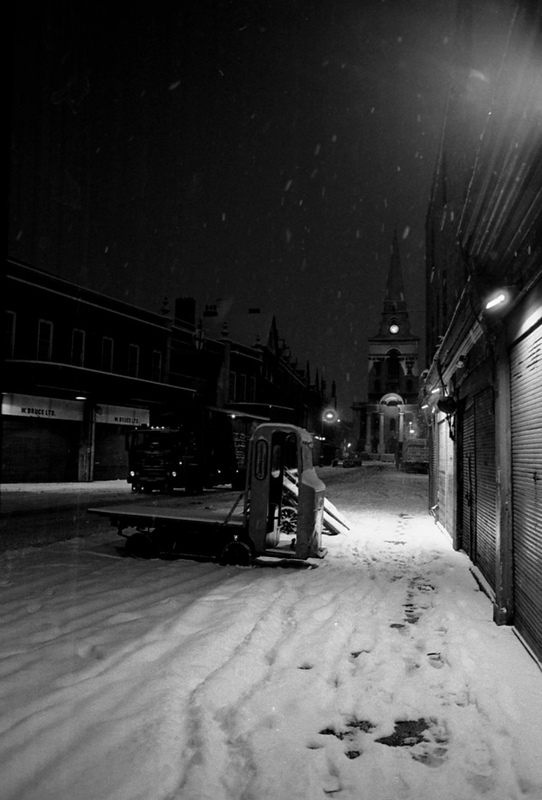 Spitalfields just isn’t the same for me anymore. 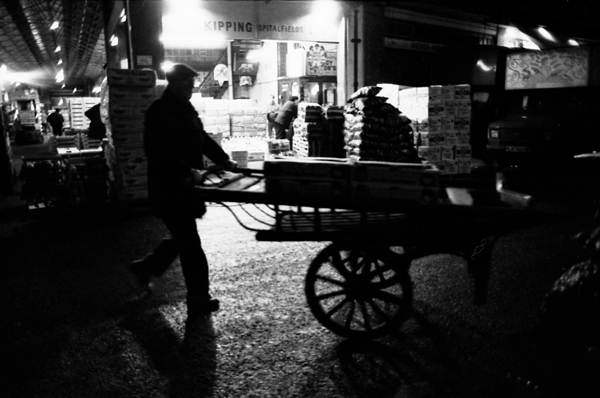 Am glad these pictures exist to show this rather unique slice of London life than try as I might to recount to my friends, they’ll never see for themselves or understand. 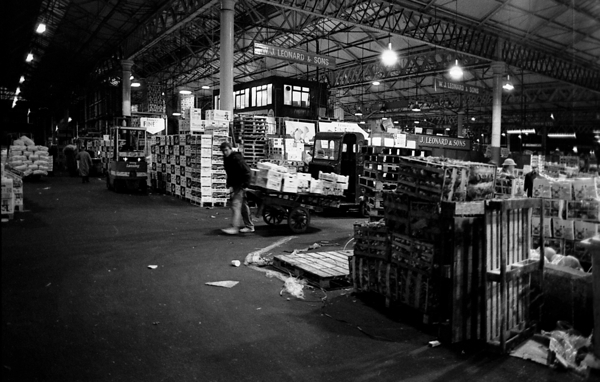 what wonderfull photos of the old spitalfields market i well remember pitching our loads of produce thourgh the long night hours back in the late sixties and early seventies almost every lorry was a rope & sheet affair backloading out the cage in the morning and jellied eels under the clock sold in china bowls. 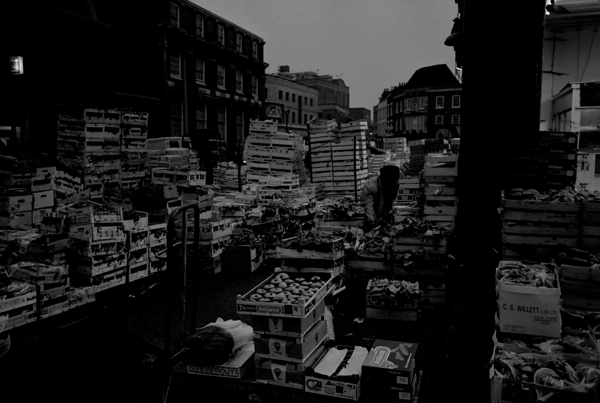 these fruit markets had a smell of fruit & vegtetables ground in to their foundations built and spillt over many many decades of trading ‘at one time nearly every major town or city in the uk had a fruit exchange e.g london alone had covent garden / spitalfields/ the borough/stratford/brentford fruit exchange/greenwich market /kings cross potato market all busy hives of activety ‘ produce coming in from all corners of the globe hundreds of lorries delivring from farms in lincolnshire/norfolk/ cambridgeshire fens / kent/ cornwall / vale of evesham e.g mostly over night the supermarkets killed the wholesale market and the real flavour of fresh british produce… oh how i,ll love to taste real juicy british victoria plums again from a wooden dutch paper topped tray fresh off a open back lorry so much better than the tasteless juiceless supermarket plastic vaculm wrapped snooker balls force fed chilled air inside a dark wheeled fridge box flown half way across the planet. 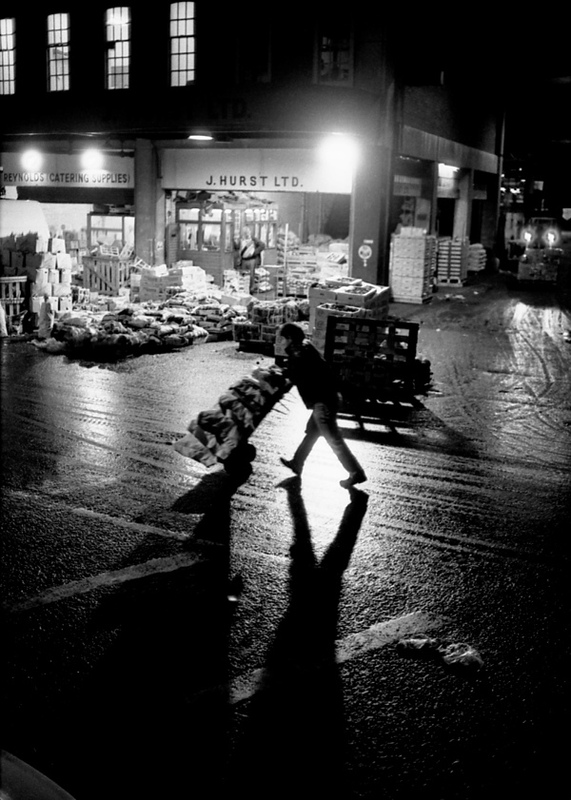 bring back the commission salesman bring back the wholesale market and grow most of what we eat here like we used to and if it is,nt in season to bad! 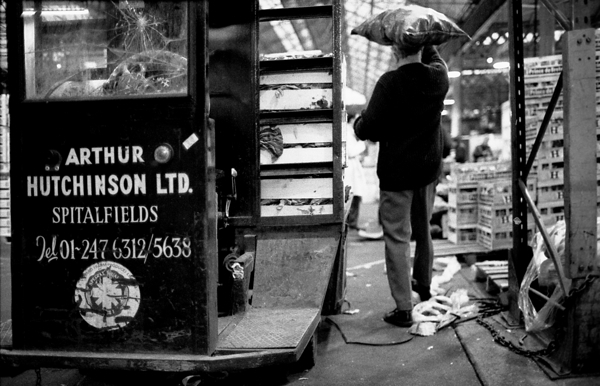 My dad had a stand Potter Oyler Ltd until it closed down in 1991. I would also love to see if there are any photographs of the stand, he would love to see them. Long gone are the good old day’s,!!!!! We had a family business, Dino’s Cafe in Crispin Strret. I have fantastic memories, making teas , bacon sausages fried eggs etc…. On God Friday we had to be there at midnight to butter hundred’s of hot cross buns. Them days will never come back so sad. Dealing with all the starving market traders. every one was friendly, Thanks to all our customers, it was a pleasure serving you all. 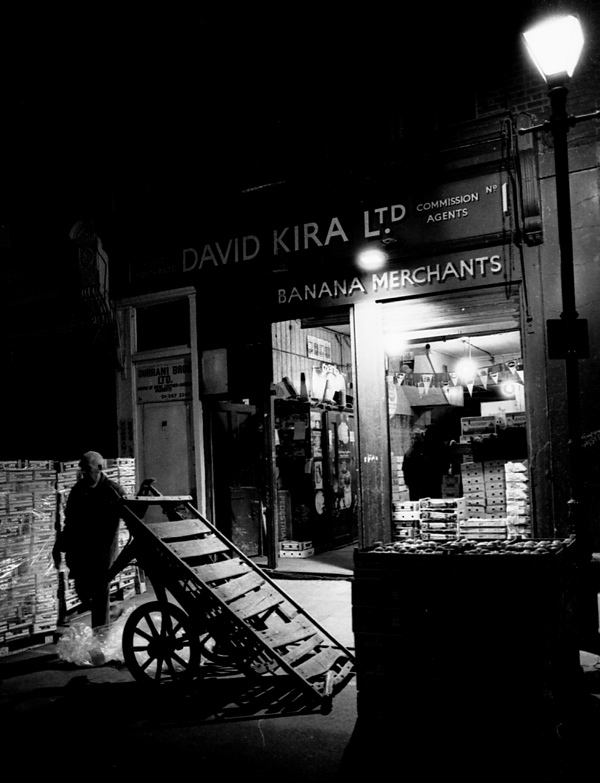 Post-war my father was a greengrocer in Wick Road, Hackney (before the war, from 1920, he had been an offal butcher in The Broadway) and between 1947 and 1956 I frequently went with him to Spitalfields market on a Saturday morning. 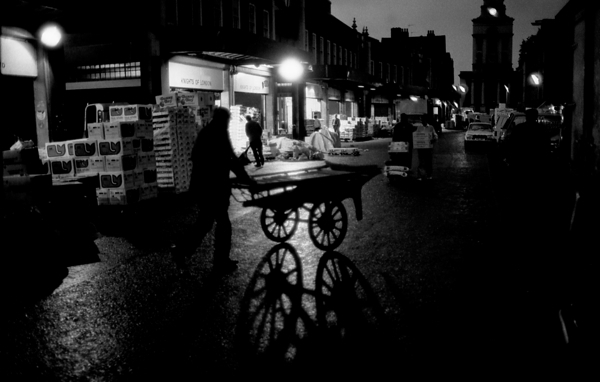 I was an apprentice at a printer’s and the visits to the market were a delightful visit to another world. An excitement quite different from my normal routine. 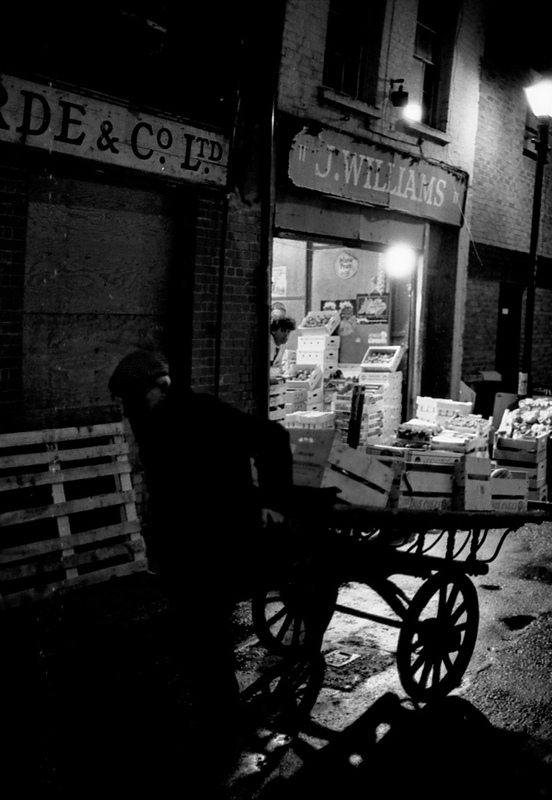 Following the Saturday market visit we would take a coster barrow laden with produce to a block of flats close to Victorial Park where I would make door-to-d00r calls on our regular customers while he served anyone who came to the barrow. 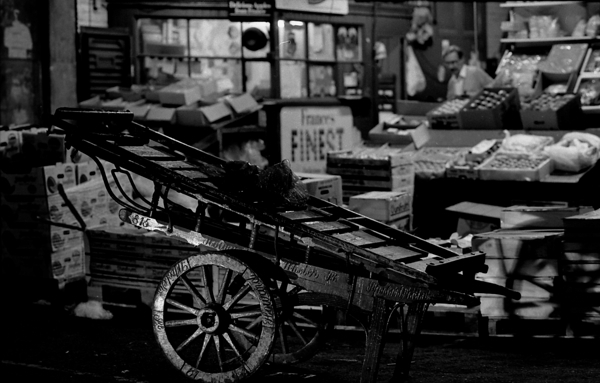 In these days of produce being shipped into the UK by plane it is easy to forget that back then our food had seasons and there would be many things that were not available except at their time of the year, and many things we take for granted were hardly seen at all. I’m grateful to have had those experiences! 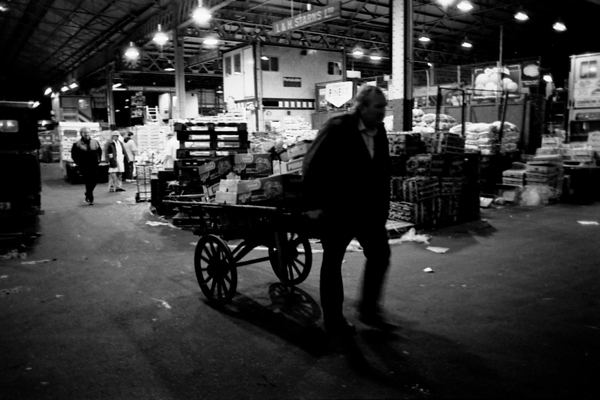 I am very eager to contact any of the Oyler family that were connected to or are descended from Edwin Oyler of Covent Garden Fruit and vegetable market. My mothers name was Ivy Finch and she had an uncle and aunt called Edwin and Edie Oyler. Aunt Edie used to visit us in Forest Hill after the end of the Second World War. She always wore lot of jewellery especially rings. My Mother used to worry about this. One day we heard that Aunt Edie had been involved in a road accident and had been found dead in a road and all her jewellery was missing. Please send me an email if you have any information. Hi Enid, Edwin and Edie were my dad’s grandparents. Pop him an email on potteroyler@gmail.com, he would love to hear from you.